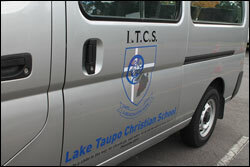 The Lake Taupo Christian School is the result of a vision held by a group of Christian families.United in their conviction of the foundational importance of a scriptural education,this group established an Inter-denominational Incorporated Educational Trust committed to high quality Christian Education.In May of 1993 they put their vision to work opening the school at the Taupo Apostolic Church in Acacia Bay Road. With an original roll of just 10 children the school grew over the next two years to the stage where it became obvious that new and permanent premises needed to be established. As an interim measure the school moved into the Taupo Soccer Club rooms and was to spend the next twelve months there until February 1997. Negotiations with the Taupo District Council continued through 1996 until a site was finally provided on previously unused land in Kiddle Drive. With it's high profile to the local community and access to Crown Park for school activities the school now had sufficient space to enable growth. The search began for suitable buildings to teach up to 100 children with administration and resource facilities. In October 1996 the equivalent of four classrooms were purchased from Contact Energy Limited and moved onto the Kiddle Drive site in November that year. The summer months saw parents and friends of the school repairing and painting in order to open in 1997. In December 1996 the school received an unexpected gift of $80,000 from one of the Churches in town and this coupled with further donations allowed the school to open the following year. The school, with a roll of 36, was officially opened on the Kiddle Road site, by local Mayor Joan Williamson on the 1st February 1997. At the beginning of 1998 the trust began investigating the possibility of integrating with the state sector. This was to determine what effects integration would have on both the curriculum and the Christian character of the school.This information provided a positive foundation to begin the process of integration with the Ministry of Education in June 1998. The school opened in the second term of 1999 as an integrated school with a roll of 52 students. 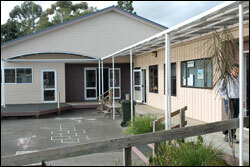 With the Ministry of Education meeting the operational costs of the school the trust embarked on a building programme in November 1999 to provide stage 1 development of classroom and administration facilities that would enhance the school's profile as a provider of quality education in Taupo. 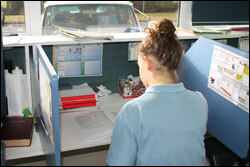 Over the next ten years the trust continued to add learning centres and facilities to the site. Today the school boasts seven learning centres, a science laboratory, library and work spaces for staff plus the administration area and storage space. These facilities are able to cater for 150 students which is the maximum number of students that the Kiddle Drive site can hold. Currently there are 90 students at the school.